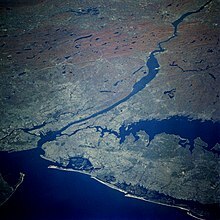 For other uses, see Estuary (disambiguation). The most important variable characteristics of estuary water are the concentration of dissolved oxygen, salinity and sediment load. There is extreme spatial variability in salinity, with a range of near zero at the tidal limit of tributary rivers to 3.4% at the estuary mouth. At any one point the salinity will vary considerably over time and seasons, making it a harsh environment for organisms. 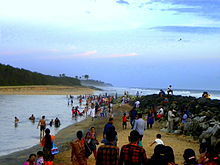 Sediment often settles in intertidal mudflats which are extremely difficult to colonize. No points of attachment exist for algae, so vegetation based habitat is not established. [clarification needed] Sediment can also clog feeding and respiratory structures of species, and special adaptations exist within mudflat species to cope with this problem. Lastly, dissolved oxygen variation can cause problems for life forms. Nutrient-rich sediment from man-made sources can promote primary production life cycles, perhaps leading to eventual decay removing the dissolved oxygen from the water; thus hypoxic or anoxic zones can develop. 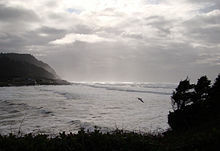 Wikimedia Commons has media related to Estuaries. 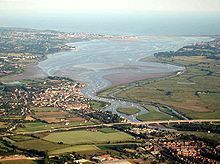 Look up estuary in Wiktionary, the free dictionary.